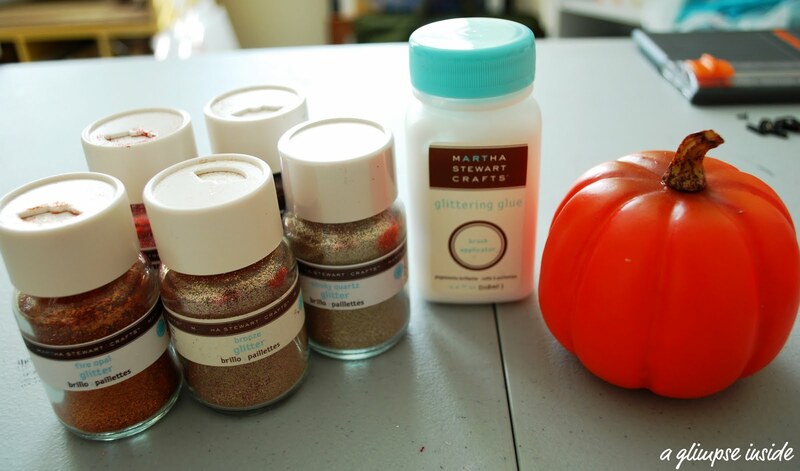 I shared this tutorial over at A Little Knick Knack earlier today and wanted to share it with you all here too. 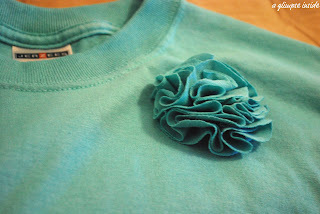 Here's how I added some flower embellishments to a plain t-shirt. I found these flowers on Little Miss Momma and she used them to make headbands. I fell in love and wanted to add these to my shirt. I pre-washed both shirts that way if they were to strink they would do it before I started the project. 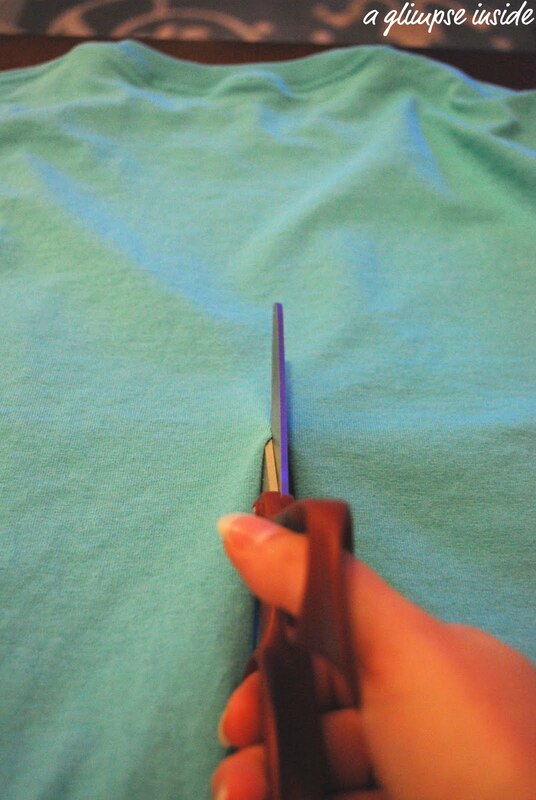 -To begin, cut up the center of your "cut" tshirt. 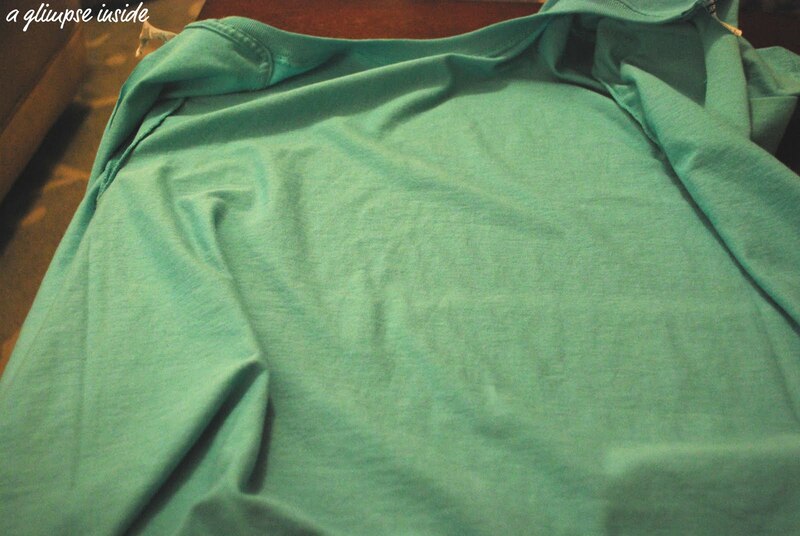 -Open up the shirt and flatten out one of the new edges you created. 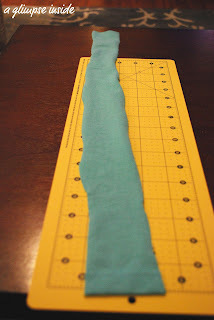 -Take your rotary cutter or scissors and cut a long strip about 2" thick from top to bottom of shirt. Cut off the seams at the ends. 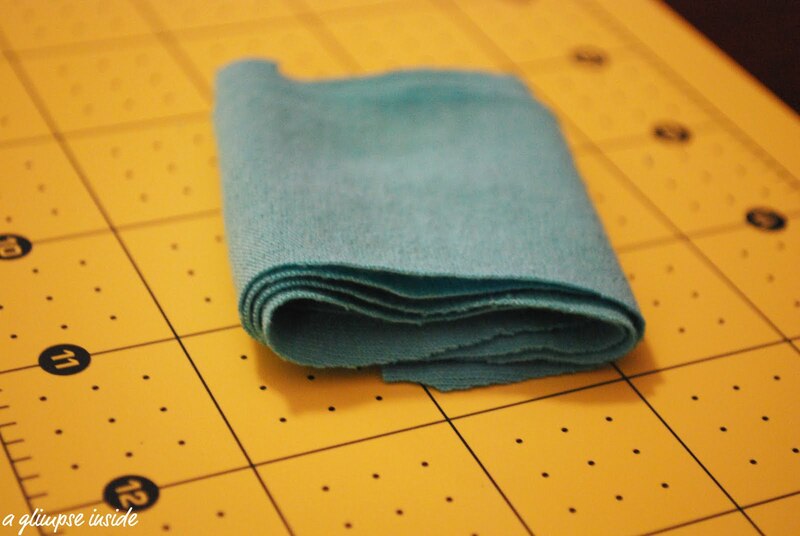 -Fold the long strip multiple times to create 2" squares. 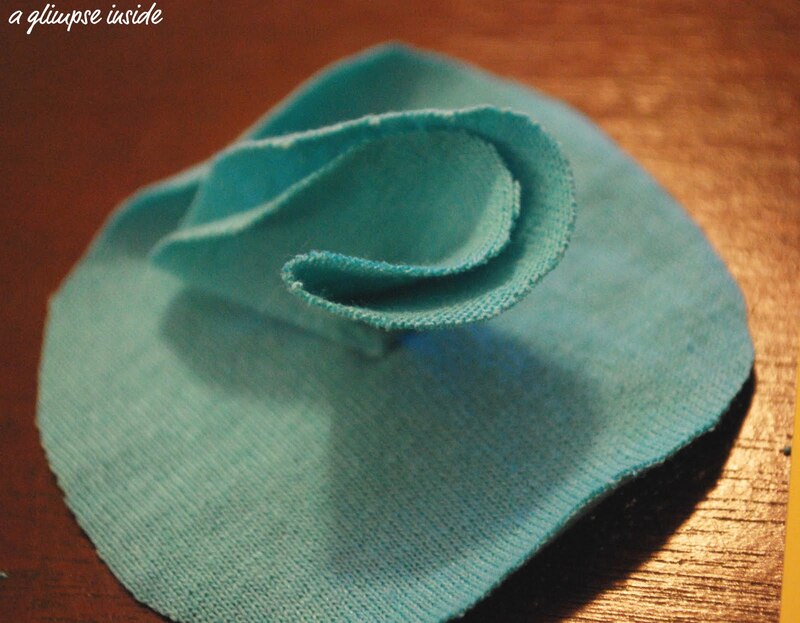 -If you like, you can trace a circle onto your fabric with your fabric pen to cut out. I just decided to free hand it. They don't have to be perfect but if you want to round them out a little, now it the time to do it. -Cut out about 20-30 circles. These will be the petals. 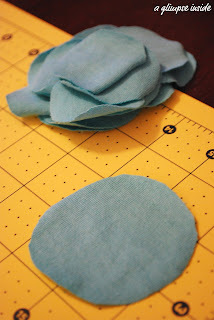 -Cut one more circle the size you want your flower. The petals attach to this piece. 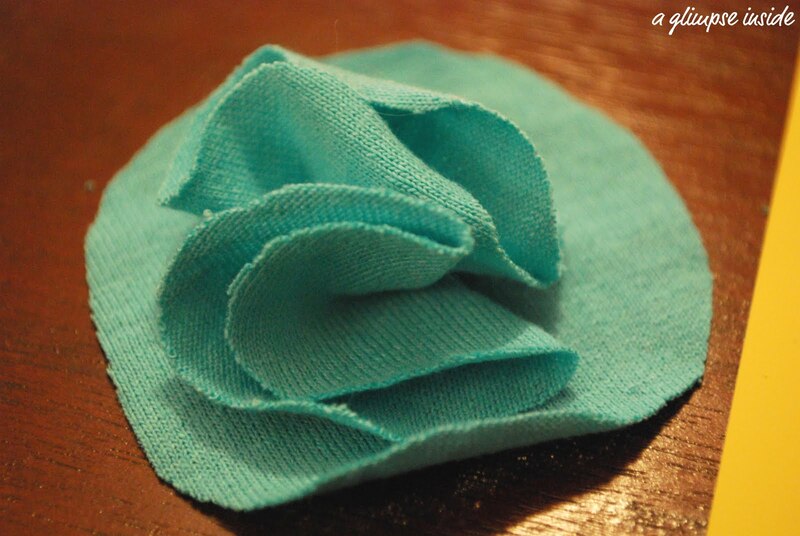 -Pick up a circle and pinch in the center forming the petal. 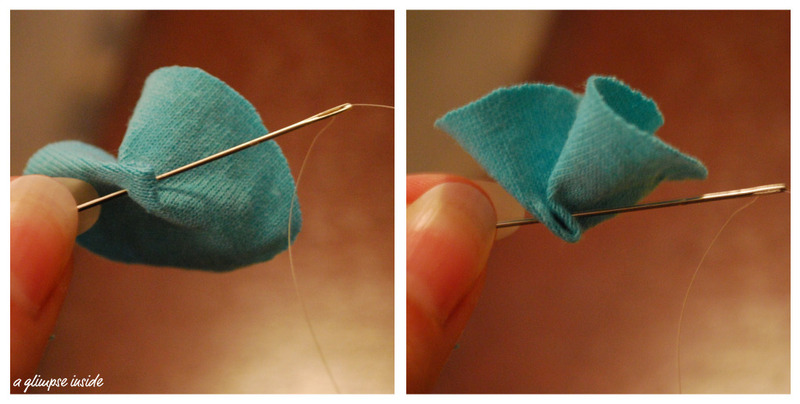 -Thread your needle and sew down the pinch section so it stays together. 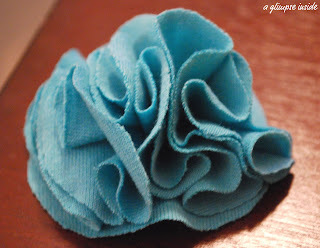 -If you check out the Little Miss Momma tutorial, she just used hot glue to do this and create her flower as a whole. I decided that I wanted to sew it all together because I was going to sew the flowers onto the shirt and I wasn't sure how hot glue would do in the washer. 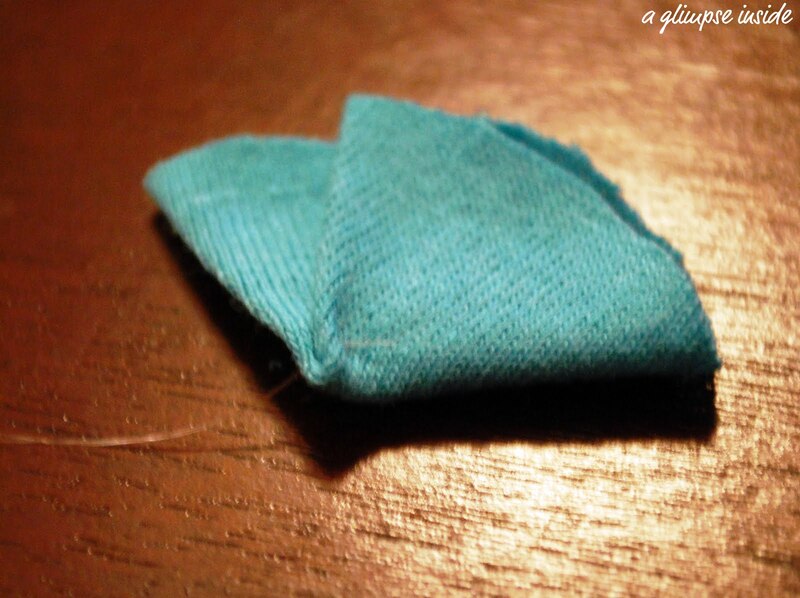 But if you don't want to sew them to your shirt you can just use the glue. -Sew to the center of large circle you cut for the base. 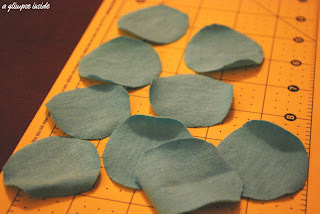 - Continue attaching the petals placing them close to one another. -Continue adding the petals until you have the flower size and shape you desire. -Sew down to shirt. I just hand stitched the back circle to the tshirt. -If you don't want to sew them down, you could attach a pin to the back of it and create a brooch so the flower is removable. 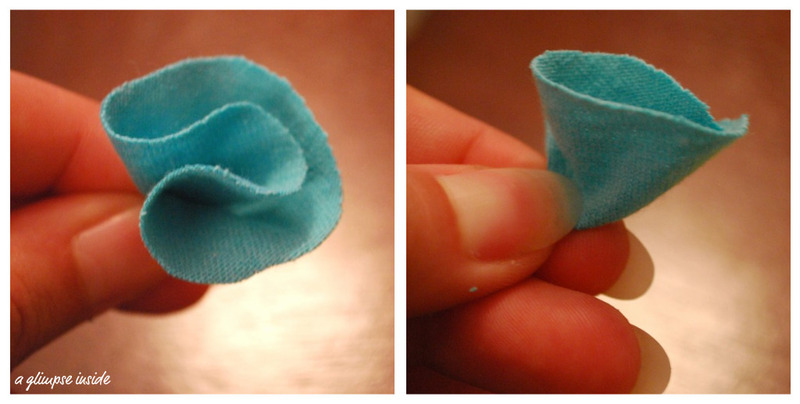 -I created another flower using a mix of white fabric and my tshirt fabric. Perhaps a few more? I haven't decided that yet. Well that looks like something I can handle. Very cute. 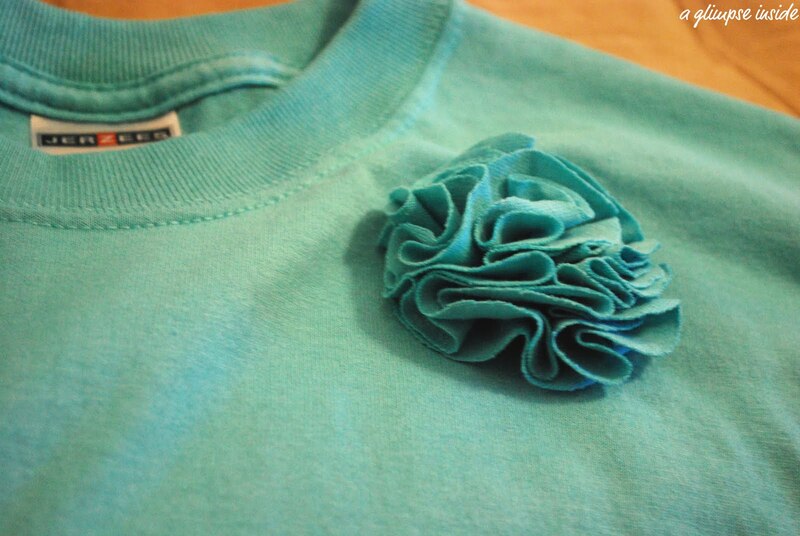 That's an adorable way to jazz up a plain tee. I'll have to try and make some of these flowers. You really could do so much with them. Super cute! Love the color. :) Thanks for the visit today! That tee is soo cute! I've done a few tee re-do lately...would love you to check them out and maybe follow along. Thank you SO MUCH for sharing how to do these! I've been seeing them all over blogland and knew they had to be pretty easy, but I just didn't know how to do them! Awesome! This is so clever! 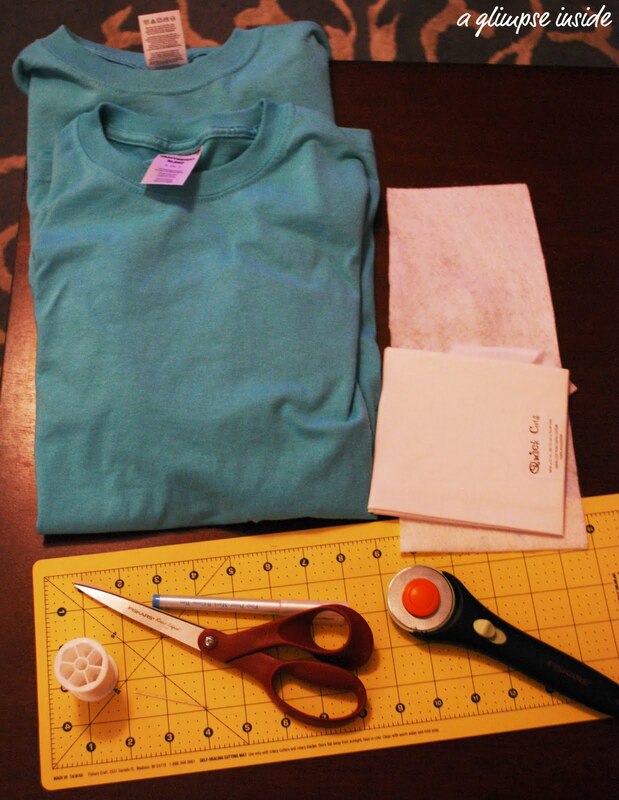 I keep wanting to do a t-shirt refashion, love yours! So cute Allison!!! I will def be making these! Thanks for the tutorial. Visiting from Tatertots and bookmarking for future reference. Very, very clever! 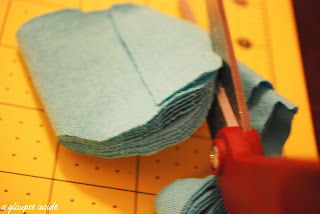 I want to update a dress of mine and this may be the perfect fix! I'm visiting from Frou Frou Decor. This shirt turned out so stinkin cute! Great job! your blog is adorable and I am in love with the pictures in your header!!! Wow these are so cute! Great job! Cute! 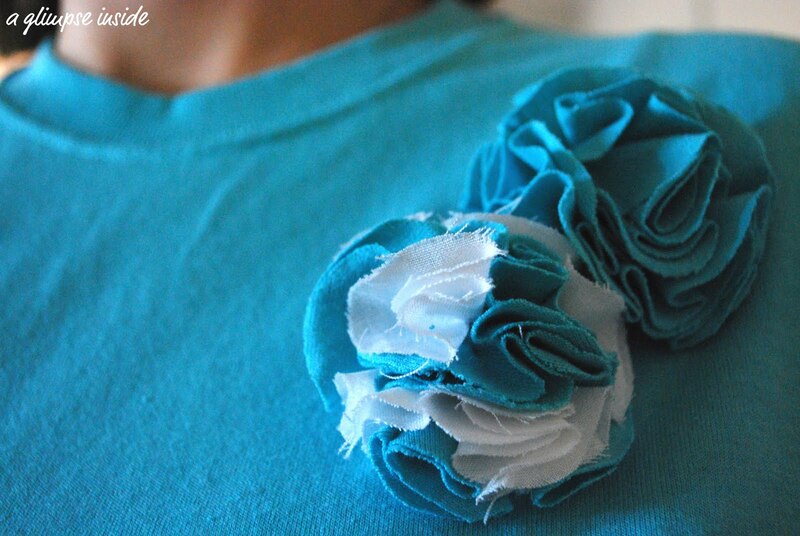 Flowers and tshirts are such fun projects. Love this tutorial - thanks!! Dontcha just LOVE funky fun fabric adornments?!? SO pretty :) Thanks for the tute! Pretty pretty pretty! I think I might try this to upcycle some older shirts...I have some pretty plain shirts that are awesome colors but have a few stains...I could either use those for the flower petals, or maybe strategically place the flowers to hide the stains! Hey Allison! Thanks so much for the tutorial. I just put up some pics of one I made and linked back to you as the feature! I love adventuresofthemichelenafamily.blogspot.com! Here I always find a lot of helpful information for myself. Thanks you for your work.